Then I was reminded of it again yesterday while listening to the BBC World Service. More on that in a moment though. According to the Wiktionary entry (which is by no means the ultimate reference, only a good place to start) the UK/US pronunciation is /ˈdeɪtə/ (which is DAY-tuh to you and… well, not me). 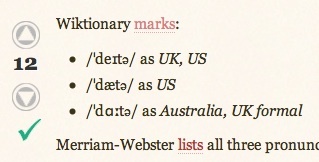 It lists /ˈdætə/ as the secondary US pronunciation DATT-uh (or ‘dadder’ to my ear). Finally /ˈdɑːtə/ familar to me as DAH-tuh and Wiki says this is not only the Australian pronunciation, it is also UK Formal. Just a moment, “UK Formal”? What might this strange dialect be? Is this what the proper people speak? Are these the tones that roll off the tongue of Her Majesty, perchance? Formal as opposed to common? Before you start hyperventilating, the OED lists DAY-tuh (ˈdeɪtə) with both British and American audio; then DAH-tuh (ˈdɑːtə) with just the British audio; followed by DATT-uh (ˈdætə) spoken like a Yank. So how did Australians end up with the same pronunciation as formal British, while popular British shares that of most Americans? Pronunciation of the word, “data,” has morphed since data processing technology emerged in the late 1950’s and early 1960’s. I still remember the expression used by our instructor: “You put “DAY TA” in “DAT” computer. Back in 1935, in the song “Why Shouldn’t I?”, Cole Porter rhymed “data” with “persona grata”. In other words, he used the “ah” sound for the first syllable. So there was once a time when classically-trained American musicians also used what has now been left to the Formal British and Australians to defend! Could it be that the popular British shift in usage from DAH-tuh to DAY-tuh only happened when Silicon Valley started to call the shots? The reason so many of my English friends get so self-righteous about this is they believe there are only two pronunciations: British and American. They’re wrong. As we’ve seen there are three recognised pronunciations, one of which is original (DAH-tuh) and mostly forgotten except by formal British speakers, Australians and Cole Porter fans. Another, which most Brits mistake for the first, is a modern colloquial North American bastardisation (DATT-uh) and the third, a not-so-lazy bastardisation that was pimped out by Silicon Valley in the Swinging Sixties (DAY-tuh). No wonder my friends take such offence when I draw the origins of their choice to their attention <evil chuckle>.While there are so many examples of Australians taking the low-road of pronunciation and abandoning the mother-tongue for an American equivalent (PROH-ject, SKED-yool and the very worrying Bushism NU-cu-lar) it seems the opposite is true in this case. Australians dutifully copied our British forebears and learned DAH-tuh by rote, but by the time the information society had kicked into overdrive, average Brits had been so indoctrinated by their cousins across the pond, they had abandoned their own very proper pronunciation for one which probably sounded a bit cooler, at the time.Thankfully though, DAH-tuh remains correct and well-utilised in Ol’ Blighty, at least by those who know. Let’s just accept no one wants to go around saying ‘datums’ which is the other accepted plural form of datum, so admit defeat for once and for all. How do you say it? Where did you learn it? Bring it on!